The Fischer-Tropsch process is gaining recognition again due to the world-wide increase in energy needs and decrease in oil availability. The increasing interest in utilizing biomass as a potential renewable feedstock in energy generation is further supporting this development. 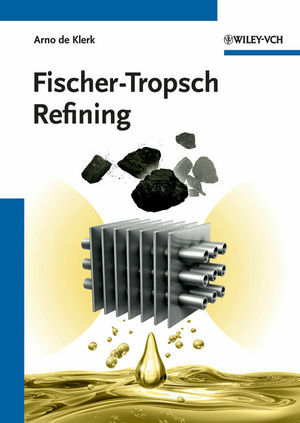 The book covers the production and refining of Fischer-Tropsch syncrude to fuels and chemicals systematically and comprehensively, presenting a wealth of new knowledge and material. As such, it deals extensively with aspects of engineering, chemistry and catalysis. This handbook and ready reference adopts a fundamental approach, looking at the molecules and their transformation from feed to product. Numerous examples illustrate the possibilities and limitations of Fischer-Tropsch syncrude as feesdstock. Of great interest to everyone interested in refining - not just Fischer-Tropsch specialists. Arno de Klerk has been active in the field of Fischer-Tropsch refining for more than 15 years. Most of his industrial career was spent at Sasol, where he headed the Fischer-Tropsch Refinery Catalysis group from 2001-2008. Presently, he is the Nexen Professor of Catalytic Reaction Engineering in the Department of Chemical and Materials Engineering at the University of Alberta. He is registered as professional engineer in both South Africa and Canada (Alberta), holding a PhD in Chemical Engineering and an MSc in Chemistry. Professor de Klerk received the Innovation Award from the South African Institution of Chemical Engineers for his work on refining and refining catalysis on three occasions.